Iwan Gwyn Parry was born in Anglesey in 1970. He completed his MA in Painting at Chelsea School of Art & Design, London in 1993 before returning to north Wales, where he lives and works. 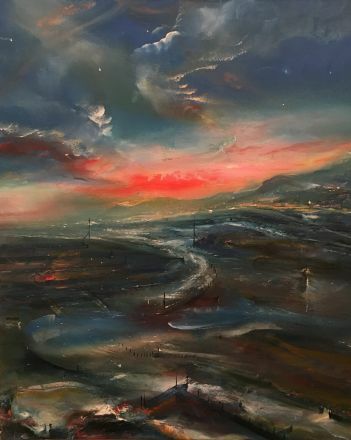 From an early age the North Wales coastline has played an important part in his life and many of his paintings feature that landscape and seascape. 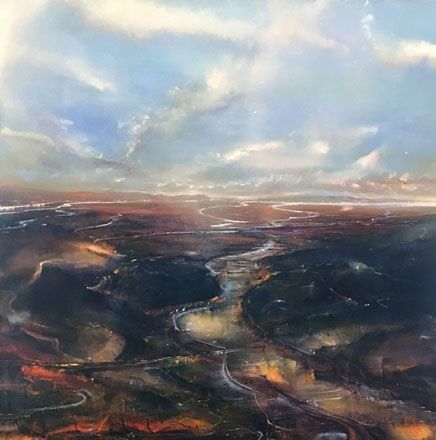 However, he is keen to point out that his paintings are not topographical illustrations of specific places, but only references to his local landscape. 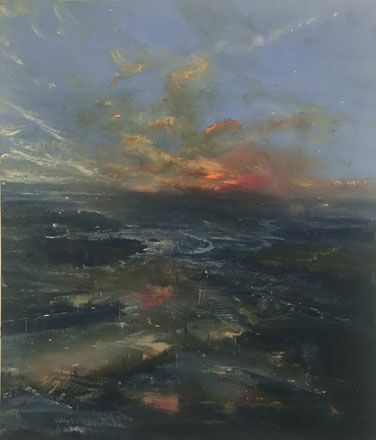 Iwan is regarded as one of Wales’ leading landscape painters. 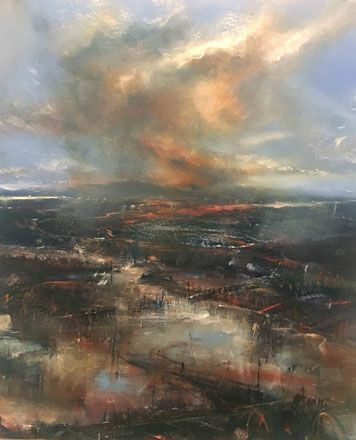 "The landscapes that occupy my paintings refer as much to a state of mind as they do to particular places, namely the north west corner of Anglesey where I was born and raised. My childhood landscape is still a haunting and mysterious place, vast and silent low-land of wind-swept places which have a sonic resonance in my imagination. The practice of painting for me is a process of uncovering, and I attempt to use metaphors of sorts to construct and present the work. The erect vertical structures in the paintings have a figurative metaphor referring to human presences and manmade structures. The remains of human activity on the land is visible in suggested elements such as embankments, sluice gates, fence-poles and structures which no longer have a function but are left as monuments in the landscape. These are deep-rooted preoccupations as they mark the passage of time and passing of land from one generation to another. I am interested in colour that produces a sensation of depth and space in the landscape such as the feeling of air, atmosphere and time of day, and that colour created through the accumulation of several transparent layers. The paintings are concerned with my personal challenge of finding a visual equivalent of my sensations and inspirations, which I am attempting to translate in a visceral and visionary way."